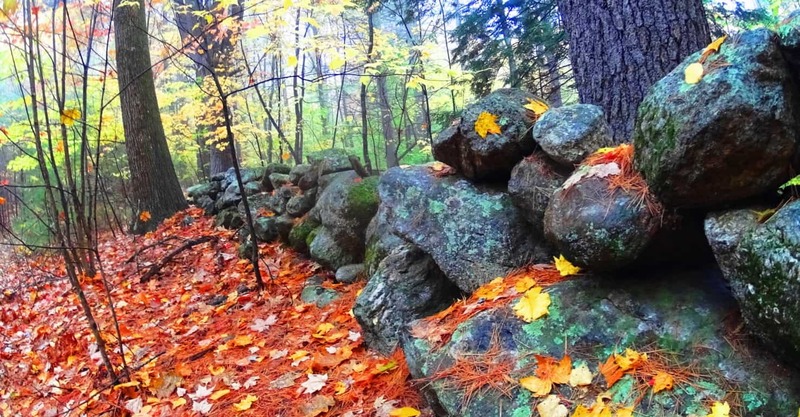 Note: The natural beauty of trails in New England, particularly in Fall, is such a blessing for those seeking a break from the suburban inundation that is the trademark of world wide modernism. That’s a mouthful of fancy words for those just seeking a peaceful, compelling, and pleasant space to hike, which Ashuburnham’ definitely is. 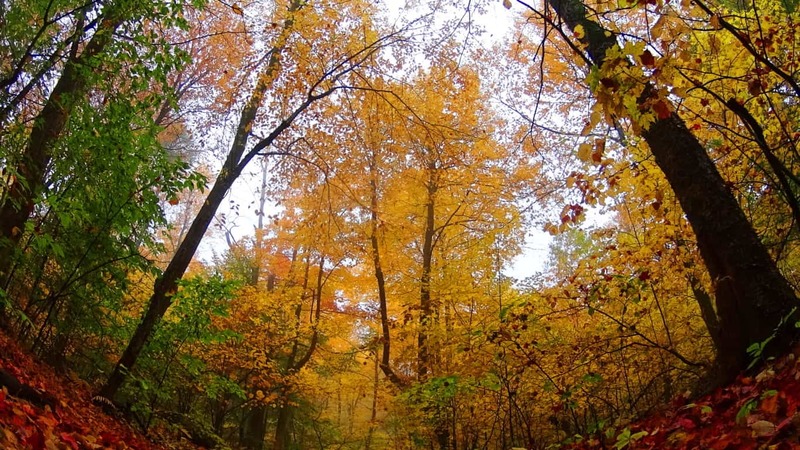 The paths here are wide and welcoming, with golden leaves literally lining the forest floor. Mingled into these golden pathways are collages of foliage, rusty-red and green with pillar size Pines, Ash, Elms, Birches, Oaks, and Maples arching over the pathways. There are several trails in Ashburnham’, most of them running north to south towards Mount Watatic Reserve about 7 miles away. The Lincoln Pond Trail is the main route through Ashburnham’ which is gladly featured in this article. This is the ideal place to keep in mind that in so many stories forests are places of enchantment. From Grimm’s fairytales to Shakespeare’s magical midsummer backdrops, historically in literary works forests have been places where extraordinary things have occurred. Places like Ashburnham’ are a superfine example of how the most delightful and unassuming woods can hold subtle secrets within, secrets that are somewhat hard to explain and bordering on the magical dimensions so many stories try to relate. Native American stories are also part of this landscape, which have unfortunately been lost to history. It should be recognized that Native stories were deeply connected to specific spots. Elevations were considered “places of power”, and various landmarks had histories behind them that often imparted a moral memory for future generations. All these things are literally stirring in a place like Ashburnham’. Simply put, there’s a lot more going on in the forests of the world than just wood, water, soil and stone; if you go deep enough, often enough, you will see. The southern entrance of Lincoln Pond Trail is a quiet country road with no visible street sign. It is just off the intersection of Hastings and Stowell roads, and is a bit hard to find, so bring your navigation device. This short country-road leads to the small car-park area, just beyond a farmhouse and picturesque barn at the end of the lane. As soon as you begin striding into the entry path there is a feeling of watchfulness. This feeling is far from fictional; ‘watchfulness’ is the unforced moment when you realize that you are not necessarily observing the forest, but rather, the forest is actually observing you. It can take years for some people to pinpoint this moment, while others acknowledge it within a few short hikes. It is a lucky feeling to achieve if you can. The misty entrance at Lincoln Pond Trail is the embodiment of “the old-growth ‘gateway'”, where the possibility of this feeling emerges in each bending branch and whistling breeze. 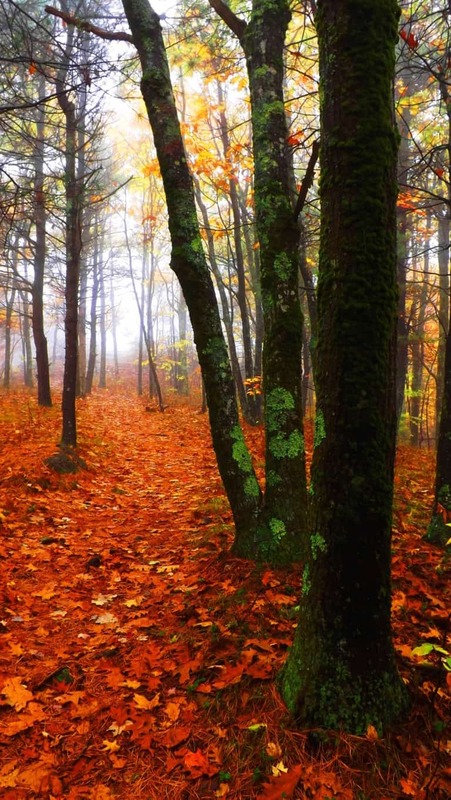 With a swift mist moving through the deep multicolored forest, you might begin to grasp that hiking is anything but primitive “walking”, it is a Godsend treatment for your sensory. Entering Ashburnham’ in late Fall of 2016 I realized that this would be my last real hike of the year. 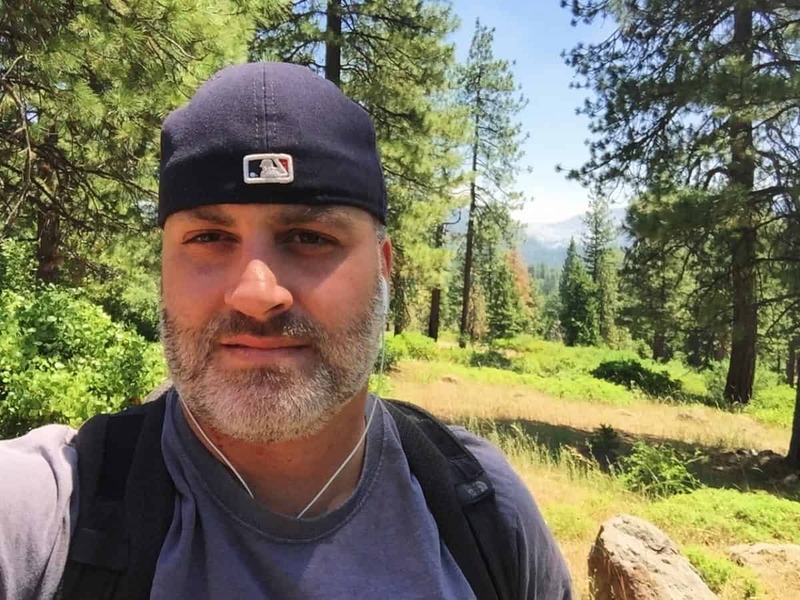 I had now seen roughly 30 state park nature Reserves in the last 4 years, inclusive of 5 countries and 6 States, (among those various countries). Since walking into Kinnitty Forest for the first time, in the heart of Ireland 4 years ago, where my girlfriend stumbled on a seashell at the top of a mountain, my life has never been the same. I discovered that if you stroll into even the most unassuming looking woods (even in the middle if Ireland), if you look deep enough, or climb high enough, you may very well find something truly wonderful that could change your outlook on the world. This was subject matter they didn’t teach us in schools, even at universities, which made it all the more stunning for me. Eventually, if thing s like this happen you have to ask why? 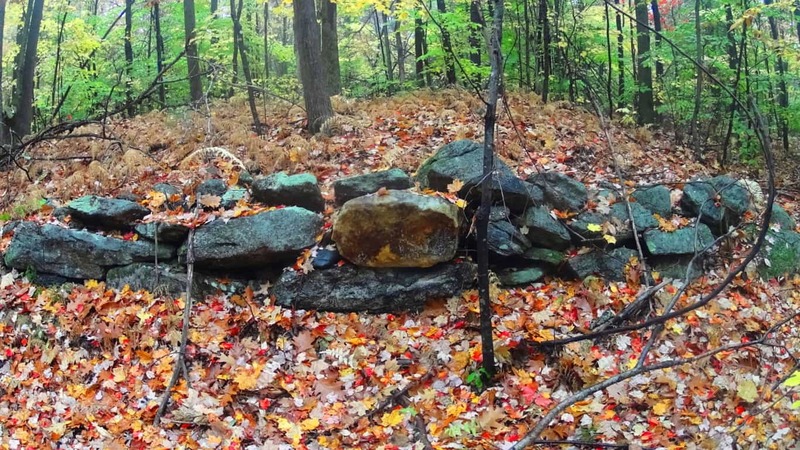 Why does every region that has yet to be suburbanized, including most of the surviving forests and mountain elevations, contain megalithic stones, ‘linings’ and cairns that are practically hidden in the landscape? why is it not brought up in our text books? It has finally become clear to me. The first culture on Earth, the first layer of culture, is a Megalithic Culture; This was an ‘engineering capable’, technologically proficient, culture. The second layer is the Native period. The third layer is the Colonial period; then the fourth layer is the Industrial movement, and the fifth Postmodern. If this is correct, than in places like Ashburnham’, where there are no layers to cover up and interfere with this first layer of Megalithic Culture, the cultural stones will be discernible. The trails here should reveal stonework just beneath an ocean of golden leaves, like a visibly enlightened landscape that guards the greatest stylized historic secret on earth. It’s like hiding a sword in a stone, deep in the forest of some forgotten place, just waiting to be pulled up. To begin, as you wander in, right away, on both sides of the trail, are beautiful stone-linings that follow the path. This is the sign of a truly ancient Reserve. Following these stones will most often lead you to something even more compelling, a rocky ledge or waterfall, which is a pattern that is also true in the fantastic Celtic Reserves to the east, across the Atlantic Ocean. Along this main ‘artery of stone’ is a tour of fantastic expressions, along with what looks like a powerfully regenerative place, a wonderfully healthy old growth forest. Groves of baby Pines flourish here, which can be seen about a quarter mile into this trail, just off the path. It indicates an ecosphere of high quality nutrients in the earth and air. The positive benefits of these energies for people is not dramatic hokum; the effects on human beings are equally reviving, and certainly far more beneficial than say, walking on the pavements of even the “nicest cities”. The classic stone-linings in Ashbunrham’ have another quality that makes the case for an increasingly in-depth explanation as to what their purpose(s) may have been. There are places in the ‘linings’ that are clearly and distinctly leading to specific boulders. Just like the head of a large serpent, many of the stones are capitalized with a free-standing boulder that seems to have been placed directly into this construct, intentionally. The idea that stone-linings, which run for dozens of miles through the landscape at Ashburnham’, were simply built along glacially placed boulders sitting at random just doesn’t make sense. The stone-linings create an order in the forest; they are a logical expression of control and directionality. Basing an entire network of megalithic stones on random ‘glacially placed’ boulders seems opposite to the entire point for a culture that actuated meaning int he deep woods by placing lines of massive stones. The boulders were most likely inserted into the stone-linings, just like other lessor stones, however hard that is to believe. And this still doesn’t answer the question, why? Below is an example of just such an expression. This classic stone-lining, which is partially covered by the foliage, runs straight into this massive boulder, like the head of a snake. Even the picture doesn’t do the scene the justice it compels in person. Lincoln Pond Trail is a comfortably gradual incline that twists through glades of differing densities and hues. It is entirely pleasant strolling through. Eventually the golden leaves are left behind for Maple glades, with red burning red leaves rolling at your feet by the thousands. 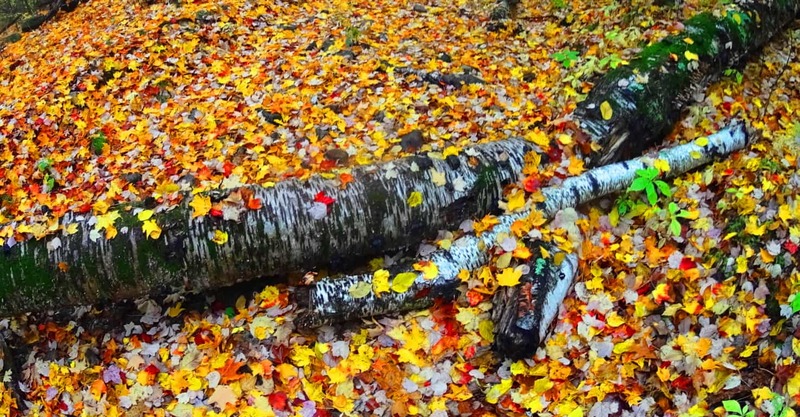 Hiking here is like twisting through a tunnel of colors and variations. The effect of color and variation on the brain is a positively stimulating and beneficial one, refreshing the senses with a refined palate for natural beauty. Drifting into this rouge dimension there are other amazing changes to see. A literal matrix of stone pathways begins to emerge; these are stones of a style I had never seen before just beneath the foliage. About 40 yards deeper into the woods, parallel to the trail, is a three-foot wide, by three-foot in height, lane of inserted stones that rolls like a wave through the old-growth woods. This is thousands of stones in an obvious statement which is boldly protruding above the ground, like a tunneled highway for Beavers. It continues for perhaps 400 yards beyond this spot. The meaning of this second style of stone through this gorgeous stretch of Maple groves is an additional mystery, but it is simply an addition to an entire set of mysteries that emerge here. Continuing along the northern line of these stones, the ground slowly elevates the path into a more unique part of the forest at Ashburnham’. This mysterious network blossoms into more obvious statements. It is hard to tell if certain areas are ancient living spaces, or focal points for some kind of work place; or perhaps this is an engineering statement with a functionality yet to be deciphered? The one thing that blatantly stands out here is that there is an entire culture of stonework beneath the leaves. If this were a Celtic area the stones and their layout would be much more visible, as the greenery of indigenous Celtic ranges, and forests, are most often layered with minimal skins of glowing moss, but not much more. Look at the right angles of this stonework below. It is clearly defining the space with stones, but the purpose is hard to decipher. These statements run for miles through the woods. Once upon a time these stones dominated the entire landscape uninterrupted. It is conceivable that the stones were here before the forest even existed. 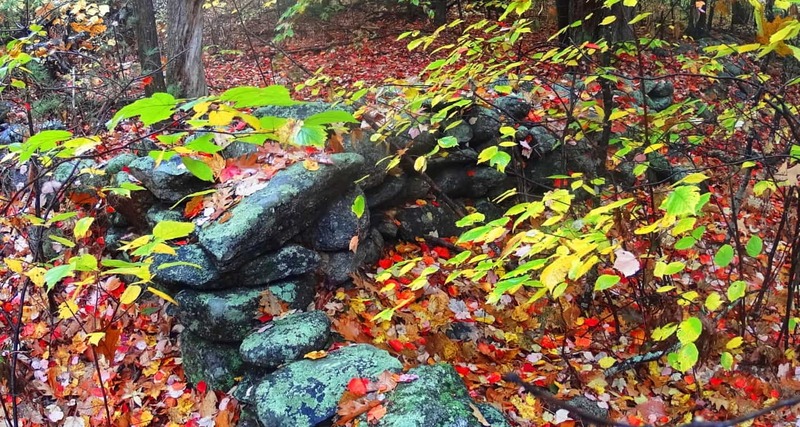 About 150 yards from this spot, off trail, is an entrenched set of stones with the look of a habitable dwelling. These dwellings can be found in crafted spaces much more distinct than here at Ashburnham’, yet to find this indicates that this place was definitely endeared and highly valued as “livable”. 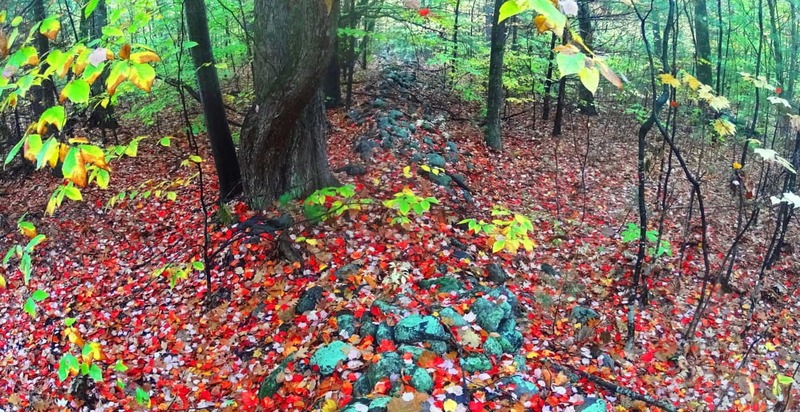 The stones below show a corner-section of what was once someones home, most likely in the beginning of history. 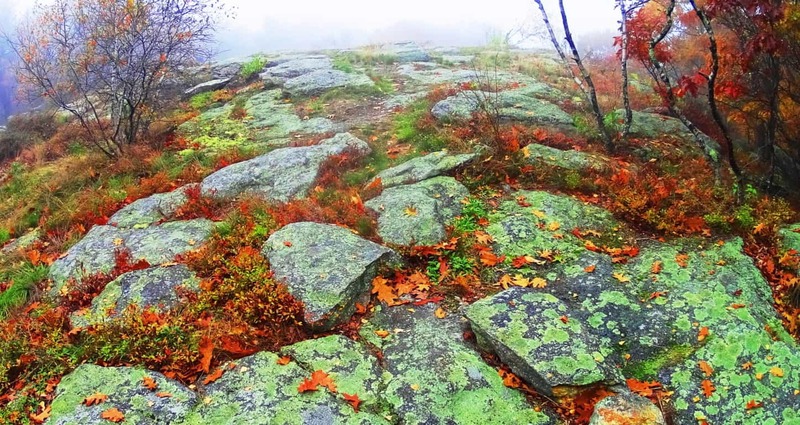 To add to the mystique of this spot, just 10 yards way is an extension of these stones that is symmetrically aligned, with a distinct quartz boulder centering the scene of entirely granite stones. The area is obviously in ruins, but there is an alignment to the overall remaining arrangement. It should be noted at this point, that none of this has anything to do with Colonial farmers. A cartographical recording of this area, a full archaeological review, will reveal a massive stone-network that is the basis of an entirely engineered landscape, harnessing sunlight in certain spaces, creating enclosures for harvested plants, connecting fixtures for navigational purposes, and relegating certain areas for irrigation. 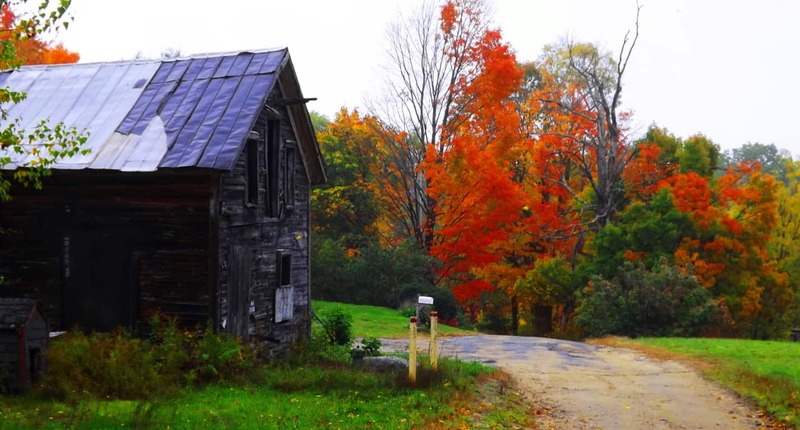 This is the case for almost every forest in western Massachusetts. Simply put, there’s a Megalithic Culture under there. Ashburnham’ is a forest without a mountain in its midst. This makes for a more pleasant stroll over the course of about 3 miles of pathways. It does have slightly a elevated clearing, one 60 foot high ledge that sits like a rocky bald head just above the small valley to the north before reaching Watatic Mountain. as you climb up the forest peals aways and a beautifully rounded rocky ledge emerges, with what looks like molded slabs that feel hollow beneath your feet. The mist culminates here, as if you were walking into a cloud. Seasoned hikers eventually learn that scenes like this are priceless, and relate a side to New England trails that is real and authentic, akin to the dreamy visions that must have prompted stories like ‘The Headless Horseman” which famously took place in the New England forests of Upstate New York, where the woods were an entirely enchanted zone not to be taken lightly for Colonial settlers. This mound feels like another planet as you make for the top. The giant slabs here seemed ‘custom fashioned’ to the hill; they are arched and fit perfectly to the rounded sides of the broad knoll while becoming more flat towards the flattened top. This fits an awesome pattern of higher elevations where ledges are carved-out and specifically rocky, while being surrounded by soil-rich old-growth forest. In short, it’s like a rocky island on an ocean of soil. I will not go so far as to say that these stones were crafted, but the surreality to the scene, the suddenness of these uniquely fitting stones along the rounded path, seems to have some kind of secret to it. To add to the mysterious situation, at the top of the rocky knoll, which is about two miles into the forest, a massive stone-lining of a style and consistency I had yet to see anywhere, even in Ireland, Wales, or Scotland, emerged rolling directly over the mound. Each stone was proportionally equal, and at least five times bigger than the average stone used in the two types of other stone-linings already tracing the woods below. Each stone looked to be at least 300 to 400 pounds, and not a single alternate stone could be seen in its procession. Whoever engineered this lining had a puritanical streak, a stubborn need for crafted consistency, which is artistic step up from the craftwork of the designers below, literally and figuratively. In the elevated milky mist, with the burning red Maple leaves looming just at the edge of the hill, it looked otherworldly, like a train track running from hell to heaven. This is an undeniable trend in so many old-growth areas; impressive stone statements placed specifically at the higher elevations of forests. This is exactly what Natives called the “place of power” in their stories. One thing that is obvious about this scene is that on sunnier days the area will obviously absorb unobstructed light for a maximum amount of time, along the with the stone-linings running over them. This set up may very well serve to channel that collected energy from the Sun out into the forest beyond, into the other stone-linings, and the valley below. I have seen a set up just like this at Cavan Burren National Park in Northern Ireland, where the landscape is interconnected by Megaliths, and of course blatantly misunderstood by local “scientists”. Coming down from this knoll Lincoln Pond Trail continues northwest, where fields and clearing are lined again with stones at the edge various and beautiful glades. These are perfect spots to sit down and appreciate everything you might have seen. The trail extends for several more miles before an optional loop back to the southern entrance, or an exit to the north. It is important to note that in several other locations in the woods, while exploring this area, there were amazing and mysterious things to see. I came upon a huge lining of stones with a symmetrical tint not far from the southern boarder. 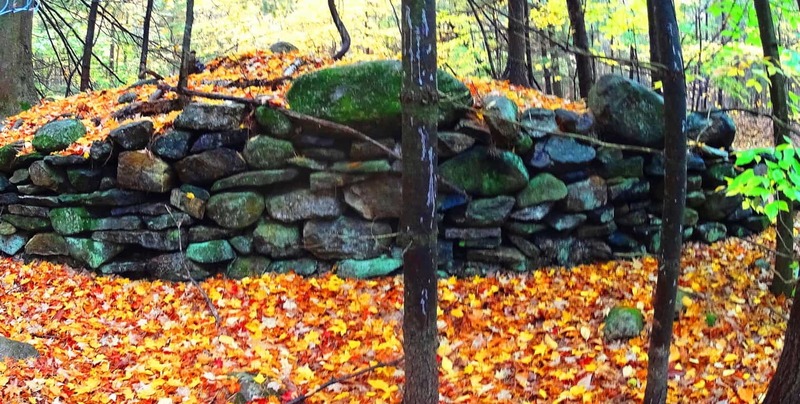 It was impressive, with the larger stones towards the top, which is another strange trend to be found in old-growth stoneworks in New England. Any mason putting the larger stones towards the top is making a bold statement, as if to say, “I can do whatever I want, despite the difficulty of crafting the structure this way.” This lining below is not far from the entrance of the trail, roughly 40 yard off to the right of the path. There may very well be something buried beneath this incredible mound. There was a great deal of effort and time put into stacking and leveling these 100 to 500 pound stones, the higher the heavier, which indicates the unique and unlimited mindset of whoever built it. And finally, not far from this ‘lining’, is what I believe to be the remnants of a New England Dolmen, now in a dilapidated state. 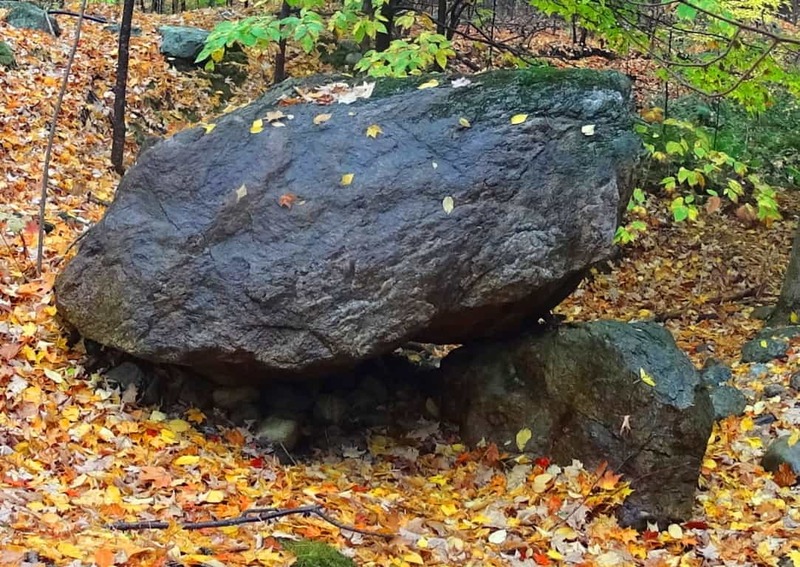 This rounded boulder was clearly supported and elevated by other stones beneath. It is now only partially supported, which has happened to several Celtic alters abroad. Whatever the truth is about this area, it is obviously an enchanted cultural center that the forest has grown over, and in a beautiful way. It’s time for anthropologists to get their heads around the idea that the stones were probably here first, and the forest, like a grafted grid, grew up around the Megaliths. 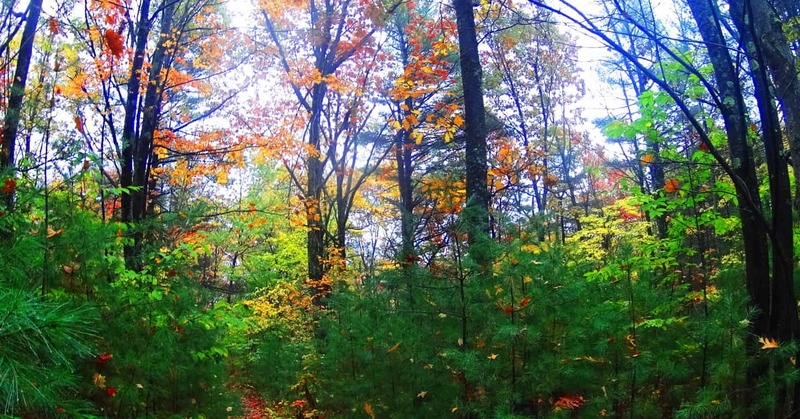 Ashburnham State Forest is the epitome of the enchanted New England hike. These woods are in a wonderful state of ‘spooky respiration’, augmented by a universe of color and decor along the trail. This place supports every magical fairytale that has ever been told, but more importantly, it supports a very real Megalithic cultural scene that increasingly emerges with each and every hike taken through these woods. 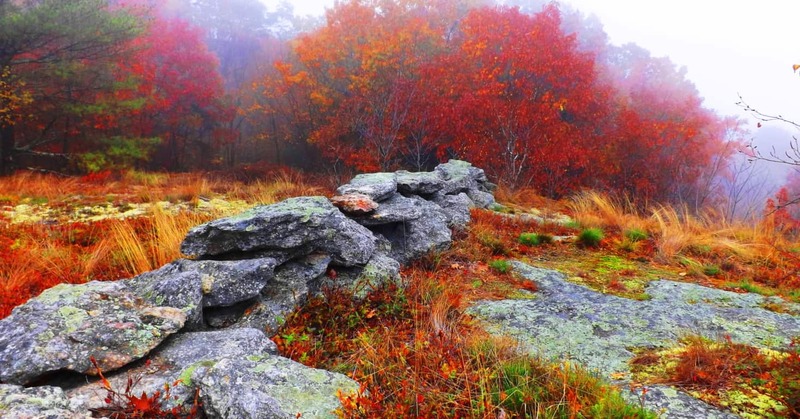 Celtic places have a very similar feel, an it just becomes impossible to ignore the Megalithic foundation of these old-growth regions in New England. If you want to see something sacred, simply find your way to Ashbunrham State Forest; it won’t take long, but be sure to take your time.